As the nation continues to crawl its way out of the economic quicksand that sunk the entire globe into a fiscal depression, Minister Louis Farrakhan warned African Americans that the United States has no intentions of recovering the entire country when it gets back on its feet. Some demographics, particularly black men, are being deliberately disenfranchised from America's wealth. 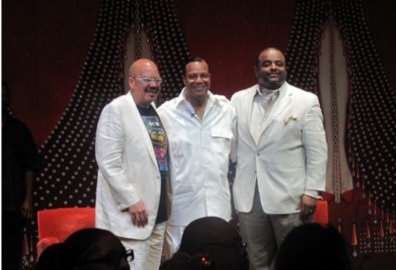 On a “Discussion on the State of Black Men in America,” Farrakhan pontificated on the state of black men from the time of the Million Man March in 1995 to the election of the first African American president in a wide-ranging, two-hour discussion with Roland Martin aboard the Tom Joyner Fantastic Voyage. The controversial militant minister use an Old Testament passage as an analogy to explain today’s plight of black men. He said when the Egyptians were contemplating a response to the exploding Jewish population, Pharaoh huddled with his closest advisers: Let’s deal wisely with them, less they multiply, join on with an enemy of ours and come against us. Farrakhan stressed that blacks, particularly black men, need to become entrepreneurs and the black community as a whole should practice the philosophy of “cooperative economics” and “pool our resources” in order to survive the economic downturn and then thrive when the country rebounds fully. “They have no intention of helping black men. Corporations believe they can satisfy both minority requirements by hiring a black woman instead of a qualified black man,” he said. Black institutions, Farrakhan implored, must be accountable and step outside of the comforts of the four walls of the church to address the needs of the people who surround and support their churches as they did a generation ago. If more young Black men (and young women) would just listen and adhere to the guidance of the Honorable Minister Louis Farrakhan, Community Activists could spend their time more wisely in support programs and community and business development rather than reacting to injustices by protests which has no effect on the wicked. Its time to be PROACTIVE rather than REACTIVE! Brother Jesse, you keep us current! Thank you for sharing this powerful message.